(Sandra’s Pick!) Ribble, Mike & Gerald Bailey. (2007). 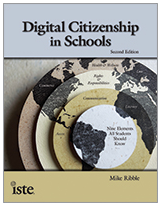 Digital citizenship in schools. Vancouver School Board Office. (2008). Responding to cyberbullying: A guide for school communities. Contact the Social Responsibility & Diversity Team @ the V-SBO. Kiwakski, Robin M. et al. (2008). Cyberbullying. Willard, Nancy E. (2007). Cyber-Safe Kids, Cyber-Savvy Teens.